David Collin describes his investigation of the centreboard winch arrangement on his Romilly, “Speedwell”. With photographs by Alistair Gillone. 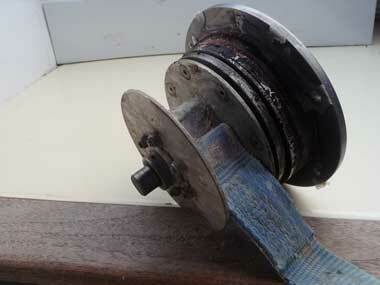 With the help of a friend who is a very capable and experienced marine engineer, I have finally got round to tackling the matter of finding out how my centreboard winch is installed, what maintenance it might require after 12 seasons, and how the webbing strap which controls it is attached to the cast iron plate. My boat was built by a kit supplied by Bridgend Boats and her sail number is 23. Boats built by Dartington (or anyone else) may be different. I should perhaps explain that in this part of rural Scotland there is no marina equipped with a hoist, so methods of inspection regarded as normal by many other owners are simply not available. I could of course have hired a crane, but in order to work underneath the boat I would need to build a staging to support her so that I could work in safety. Not knowing what I might find could have meant that it was necessary to rehire the crane at a later date to relaunch. This would have been very expensive so I was keen to find out if a simpler means of access was feasible. Firstly, with the boat sitting on her trailer, we made sure that the centreboard’s weight was resting on the trailer and the webbing strap which raises and lowers it was slacked off. We decided to begin by unfastening the self tapping screws on the outer rim of the winch face plate, on the starboard side of the boat (the side on which the winch handle is mounted) having first marked both the face plate and the grp so that the self tappers could be returned to the same holes as they were originally in. With all six screws removed, we then very gently prised the face plate clear of the carefully protected grp. This had to be done very cautiously as it was bedded in sealing compound (essential for the waterproofing of the vessel) which had considerable strength. When it eventually came clear, it was possible to withdraw the entire winch assembly, slacking off the webbing strap as necessary. The winch pivot has a stainless steel stub which fits neatly into the plate on the port side of the boat and is held in place entirely by the fixing of the winch assembly to the starboard side. Everything seemed to be in good order and I decided not to take any other pieces of the assembly apart. I was curious as to how the friction that holds the centreboard in any position without any ratchet mechanism was achieved but I decided to leave well alone, being wary of a mass of tiny springs and screws pinging their way down the inside of the centreboard case. My trusty engineer would probably have preferred to investigate everything, but was far too polite to say so. 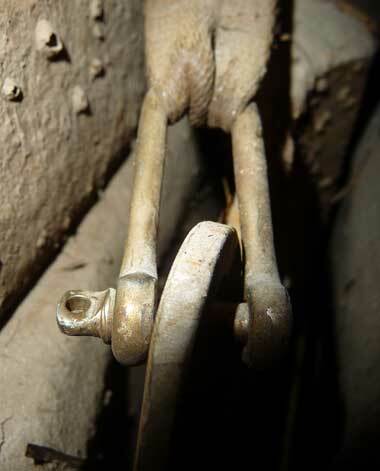 We could see no need for any maintenance whatsoever, other than one matter not previously mentioned – A series of Allen keys holds the starboard side of the winch drum to the part of the winch that houses the winch handle. Several of these Allen keys had worked loose and required to be tightened. This can be done through the inspection eye at the top of the centreboard case that has been fitted to Bridgend built boats, but it is best checked when the winch is out. We then tried to check on the method of attaching the webbing strap to the centreboard. This was initially difficult due to the darkness inside the case. Although a torch could easily be directed to the fastening, it was not found possible to see to the exact spot with the naked eye. The problem was solved by judicious use of a small digital camera lowered inside the case. 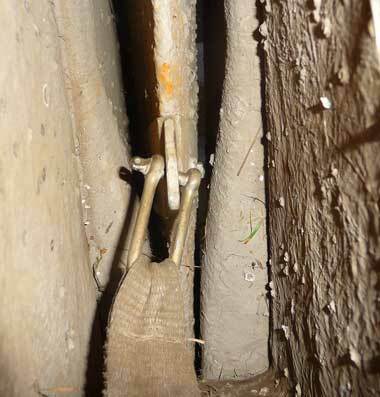 The photographs that resulted show that the webbing is secured at its lower end by a stainless steel shackle that is in turn connected to a Y shaped plate that straddles the top of the cast iron centreboard and is secured to it by a stainless steel bolt. Everything seemed in good order, the only matter perhaps requiring attention being that the shackle pin, though tightly fastened, was not lashed in or wired. I think this can be done through the hole in which the winch is fitted, dependent on the size of your hands and the extent of your patience and ingenuity. Lastly, when reassembling everything, remember to bed the winch face plate and the inspection eye cover on a good quality waterproof sealant. A serious leak could otherwise result!